SHELDON LEWIS had been kind enough to grant me an interview——and I must confess that the prospect of meeting the hero-villain of “Iron-Claw” fame, left me as excited and flustered as a school-girl. For a villain is meant to be cordially hated during the interim of the play or picture; any admiration one feels for his superb acting must be fought out in the privacy of one’s home—and not openly expressed. Anyway, that’s the dictum handed down from grandmother’s time. Now I kept watching the passive, finely chiseled face as Mr. Lewis talked of his books, his home, and above all treasures—his wife. Somehow he didn’t fit my conception of what a “reg’lar” villain should look and act like. He was too sympathetic, too sensitive and fine in his ideals. RECALLING the days when Mr. Lewis played the “legitimate,” one has only to think of the wonderful press notices he received after acting the dual roles of “Dr. Jekyll-Mr. Hyde.” These were better than Mr. Mansfield, himself, received. No matter what part Sheldon Lewis is asked to portray, he gives it careful study and virtually lives the character. If the scenario or play calls for the suave, man-about-town, you may rest assured that Sheldon Lewis looks and acts the part to perfection. He is a credit to his tailor. At the same time he can portray the lowest type of criminal with a realism that is almost uncanny. NOW I wanted to delve deeper into the man’s personal character-and my only hope lay gathering the information from those who knew him intimately, about the studio. They were not only willing, but anxious to talk of the sterling qualities of Sheldon Lewis-—who is a sort of demi-God with those who work with him. For one thing I am told, he welcomes criticism from every source. If a stranger were to walk into the studio and make a suggestion—he would give it as careful consideration as if it came from the director himself. They also spoke of another little fellow, who is now employed as an office boy who came to the studio seeking a job. He was a bright fellow but dirty and shabby in appearance. Mr. Lewis took him in hand-—bought him a complete new outfit—suit, shirt, shoes, hat and overcoat and gave him his chance. This sounds more like the hero of the picture—and not the usual wicked villain— doesn’t it? 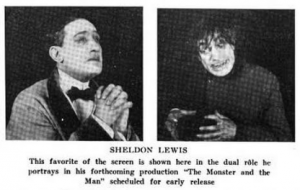 AND speaking of villainous roles—it is interesting to note that the big Pathé serials in which Mr. Lewis was starred, “The Hidden Hand” and “The Iron Claw,” are still being shown in Australia, China and India—and he receives thousands of letters from his admirers there, to this very day. This in itself is significant. It is customary for the self-sacrificing hero, the kittenish ingenue and the fascinating leading woman to receive billet doux from enthusiastic admirers of both sexes, but when the same attention is paid to an artist who specializes only in villainous roles, it becomes a marked tribute to his acting ability and the firm hold he has managed to get on his audiences. The only trouble is that Mr. Lewis’ correspondence often needs an interpreter capable of multifarious linguals feats, for letters from China, Italy, Morocco and Peru are brought to him daily by the postman.